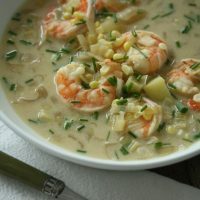 This shrimp and corn chowder recipe makes extra use of the wayward corn cobs and shrimp shells by using them to create a super flavorful stock. With all that great seafood and corn flavor in the broth, you'll hardly notice that the creamy base is coconut milk instead of heavy cream. On a clean work surface, remove the kernels from the corn cobs and set aside. Cut the cobs in half lengthwise (or break them in half with your hands) and place them in a medium stockpot. Peel and devein the shrimp. Set the cleaned shrimp aside with the corn kernels and add the shells and tails to the stockpot with the cobs. Cover the cobs with 2 quarts water and bring to a boil. Briskly simmer the stock over medium heat until reduced by half, about 30 to 40 minutes. Strain the stock through a colander or fine mesh sieve and return to the pot. Discard the solids. Meanwhile, in a large Dutch oven or saucepan, heat the oil or butter. Saute the onion and leeks over medium-high heat until soft, about 5 minutes. Add the wine and cook until reduced by half, 2 minutes. Add the clam juice, potato, shrimp stock, salt, and thyme. Bring to a boil then simmer, covered, until the potatoes are al dente, about 10 minutes. Whisk in the coconut milk and sriracha. Fold in the corn kernels and shrimp. Return to a simmer and then immediately remove from the heat. Taste for seasoning and add the chives. Ladle the chowder into bowls and serve. Use the time that the stock is simmering to prep your remaining ingredients and start cooking the rest of the chowder.